Trenching is an important aspect of excavation yet it is also dangerous. That’s why when you’re looking for an excavation service, you need the trained crew of 4 Warriors. They know how to implement trenching quickly, effectively, and safely. First, let’s go over what exactly constitutes trenching. As stated by the Occupational Safety and Health Administration, trenching is removing large quantities of earth to form (often wide and deep) trenches in the ground. As you can imagine, it ends up being a big part of excavation in general. What makes it so dangerous is the fact that trench-related accidents account for hundreds of construction injuries every year. It’s not difficult to see why, either. If a worker is in a trench when it collapses, they are at risk of serious injury or even death. These deaths are preventable and we take it as our Christian duty to do whatever it takes to guard our fellow man. We are sure to practice safety measures as outlined by OSHA, to ensure maximum safety for our workers and timely completion of the work. We do not operate in unsafe trenches and take proper steps to prevent accidents in the first place. When trenches deeper than five feet are built they are given a general protective system. 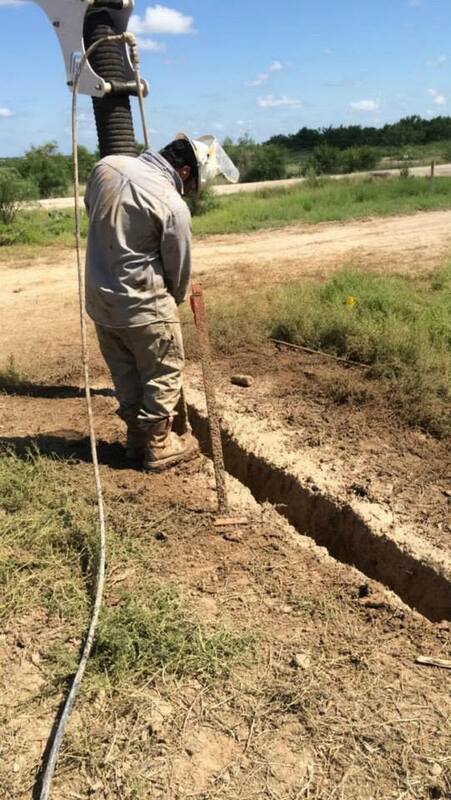 For trenches below 20 feet, an engineer is required to build a custom safety system. These are merely some of the practices 4 Warriors Hydro Excavating’s highly experienced team uses to guarantee a safe and efficient job done. For assistance with your trenching needs, or anything else, feel free to contact us at any time. Thank you and God bless! Trenching and excavation are among the most dangerous construction jobs there are, which is why it is important to follow safety guidelines as outlined by the Occupational Safety and Health Administration (OSHA) to keep yourself and your crew safe while performing them. Before getting started it is important to be clear about what trenching and excavating include. According to OSHA, trenching is the operation of digging trenches that are usually deep and wide. Their definition of excavation is the act of removing earth to build deep impressions in the ground, including trenches. In other words, the two jobs are almost similar in many ways and for the purpose here can be used synonymously. What is beneficial for one, is most likely going to be good for the other. Each year trench collapses are responsible for hundreds of construction-related injuries. The caving in of trenches on excavation sites are the greatest threat to construction workers and many times end in fatality. To protect you and your workers from such hazards, never enter or allow your workers to enter unsafe trenches. Any trench that is deeper than 5 feet has to have a general protective system in place. For trenches that are deeper than 20 feet, a safety system designed by an engineer is suggested. If no engineer is available then it is also acceptable to use safety measures designed by highly-qualified engineers who have adequate experience in trench and excavation work. Sloping: cutting the wall of the trench at an angle. Aluminum Hydraulic Installation supports used to prevent cave-ins. Shielding: using boxes to prevent cave-ins. Since so many factors are involved in the design of safety systems as they pertain to trenching, OSHA suggests hiring a qualified person or team that can identify and resolve any potential hazards before construction workers begin excavation or enter any trench. This person or team must inspect the work site daily before the work starts. The safety guidelines mentioned above are by no means a substitute for professional safety advice. They do, however, give a general idea of the basics of creating a work-safe environment, especially for those who work at excavation sites. Never use heavy equipment near the edges of a trench. Always inspect the safety of a trench after rain. Keep work material 2 feet from trench edges. Inspect trenches each day before work starts.Always test for hazardous fumes in trenches before each shift. As a Christian family-owned business, 4 Warriors Hydro Excavating, believes in taking care of their customers – their family – as the Lord would want. The company offers some of the best workers and technicians in the industry and uses only top-rated machines and materials to perform their work. If you are interested in what 4 Warriors Hydro Excavating has to offer, contact us. 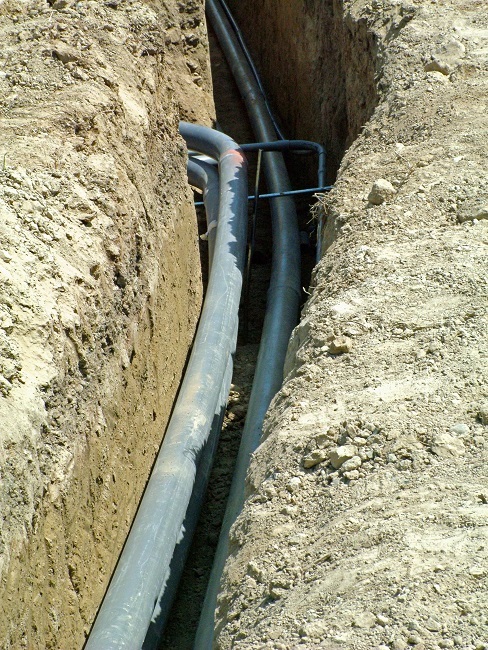 Trenching safety should be a priority for any construction company or contractor. According to OSHA, trenching is among the most dangerous of all construction endeavors. OSHA can and does fine companies and contractors for ignoring the safety protocols for trenching. Worse, these protocols are readily available and very straightforward. The main theme in trenching safety is avoiding serious injury and the loss of life through common sense safety. Cave-ins occur suddenly and without warning, and are devastating. The sheer weight of the soil, dependent on a number of factors, is enough to cause numerous fatalities. Cutting corners will not only result in serious injury or death but also hefty fines from OSHA as well as civil lawsuits. For contractors, OSHA fines can be severe enough to close your doors. Thus, it pays to follow the rules and ensure that excavation practices are safe. Trenches of certain depths must have safety systems. The complexity of these systems depends entirely on a few different environmental factors. They include soil and rock stability, soil moisture levels, and forecasted weather changes of the area. These judgments need to be made by what OSHA terms a competent person, such as an engineer. A competent person will take the above factors into considerations when advising on safety systems. 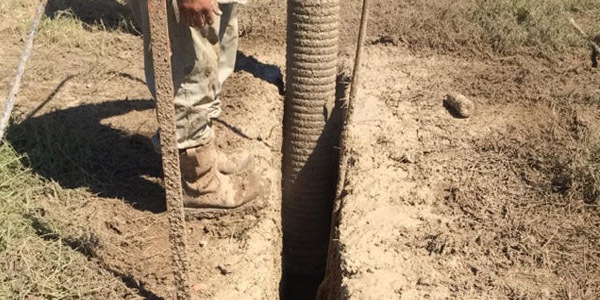 The inherent risk of trenching, including collapsing loads and falls (to add onto the environmental risks) means that inspections need to continue throughout the process. All workers should also be outfitted with fall protection gear. If a worker feels trench conditions are unsafe or that protocols have not been met, he or she should not enter the trench. When trenching, focus on safety and accident prevention. Be sure to prioritize OSHA regulations and utilize the knowledge of competent persons to set up a safe, secure work environment. To learn more about safe trenching, contact us today. There are many organizations and companies involved in building a community — a whole myriad of contractors. Among those are Excavators. Before the new wing of a library can be constructed, electrical lines and utilities need to be exposed so that they can be rerouted. Before those new classrooms can be built, old lines and gnarled tree roots need to be found and removed, and trenches cleared to put new lines in. There are a few ways to go about trenching and excavating an area. Some of the basic methods are manual digging or using a backhoe, which can seem like easy ways to get the job done if you aren’t calculating the risks and labor involved. Using a backhoe is powerful, but that machine is bulky and clumsy, and can end up causing more damage and therefore incur more costs. That giant claw does not have the precision required to clear dirt around pipes and wiring, and can even destroy them. Manually digging around everything might solve this problem, but this method is very labor-intensive and time-consuming. Everyone involved in business knows: time is money. This is where hydro excavation comes in to save the day. Trenching via hydro excavation is an efficient, cost-effective service offered by 4 Warriors Hydro Excavation. Not only can they get your project moving quickly and efficiently, they are a company that truly values the customers and community that they serve. They can guarantee safety and reliability at competitive, thoughtful pricing. Contact us today for an estimate and see how hydro excavating can make help with your next project. The job site stretches on, flat and yet unblemished, the project is about to begin. Many boots, trucks and tracks will cross this ground in the following year as the ground is shaped and churned, then raised to a new height, as a neighborhood center, hospital, public high school, or backyard oasis. Yet, beneath those boots and heavy wheels, will lie the network of cables, pipes, and foundations which make life in these future spaces liveable. The problem is, with the first arrivals at the site, there are still many unseen obstacles to laying down the systems for modern living. Looking at the site plan, the trenchers see existing utility lines, old trees with large root systems, and countless other unknown objects likely buried in the ground. 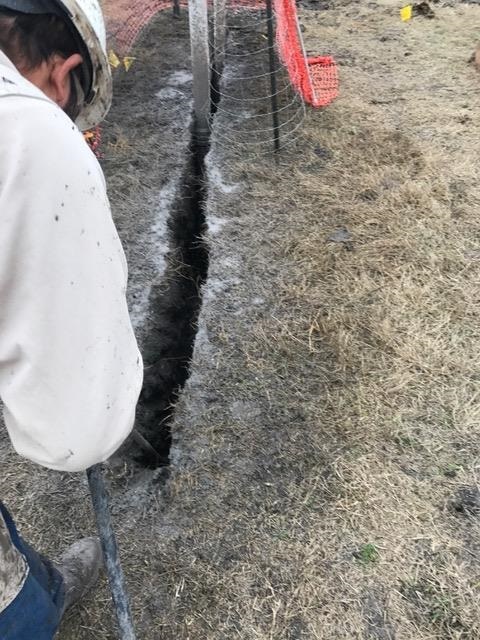 As the excavator engines fire up in the hum of a Texas morning, and as the crew mans their shovels to assist, the first trench is dug deep to allow for the plumbing of the new structure. Scoop after scoop of dirt is removed monotonously and the trench lengthens slowly. As the sun rises overhead, sweat is on the brows of all the men working. The afternoon comes and then halts quickly. A fiber optic cable cutting across the field was marked ten feet too far north on the plan, and the flags marking the line were run over by a truck delivering material. Now the expensive cable has been ripped out by the teeth of the excavator bucket. It will be hours before the company which owns the line can arrive and fix it, at a hefty price. All the men stand there idle and hot, their progress dead in the water. But if this crew had been using vacuum excavating, they may not be standing so idle. The use of pressurized water would have jetted right around the line, never severing or ripping it. They could keep moving along without having to fight the dirt’s resistance; the water doing the tough work for them. In the matter of a day, the vacuum excavators would have all the plumbing done, while a crew with the old bulky diesel digging machine would just be finishing up one main line, with many more battles against the dirt ahead. Trenching is the part of construction which is unseen in the end product, but it is the part which makes the end product function. Shouldn’t the unseen be finished and out-of-the-way as efficiently as possible? We are here to help you begin to see your plan become a functioning reality, as quickly and efficiently as possible, because you and your vision matter to us! Technology is a good thing, better yet it is a great thing when it saves time, money and even lives. Hydro excavating is an example of new technology that is inching its way into commonplace in the world of construction. Contractors are choosing hydro excavating over traditional backhoe as they become educated to the savings in time, insurance and clean up. Highly pressurized water is used to cut through dirt while a vacuum system simultaneously removes excess soil. Why is it better than traditional backhoe digging? Hydro excavating is much more precise as it removes the soil. There is far less clean up work and the risk of damaging pipes and utility line is low. Contractors prefer hydro technology over traditional big machinery because it is precise, cleaner and saves money in insurance due to its higher safety rating and lower man power needs. Why use hydro excavating for trenching? Trenching is actually one of the most common uses of hydro technology. There are several forms of trenching. Each has its own application depending on the type of work to be done. A few forms of trenching include slot, box, cross and exploratory. All trenching work begins with a pothole. The water pressure/vacuum system efficiently cuts straight down into the soil, digging as deep as needed for the necessary application. Once the proper depth has been reached, trenching in either a straight line or a circle will begin. Hydro excavating can complete slot trenching by cutting a narrow and very accurate line. This will allow for burial of pipeline, fiber optics and cable lines. Contact us to learn what 4 Warriors Hydro Excavating can accomplish for your next construction project or pipeline repair work. We have a reputation for integrity and excellence in service. Give us a call, you’ll be glad you did. 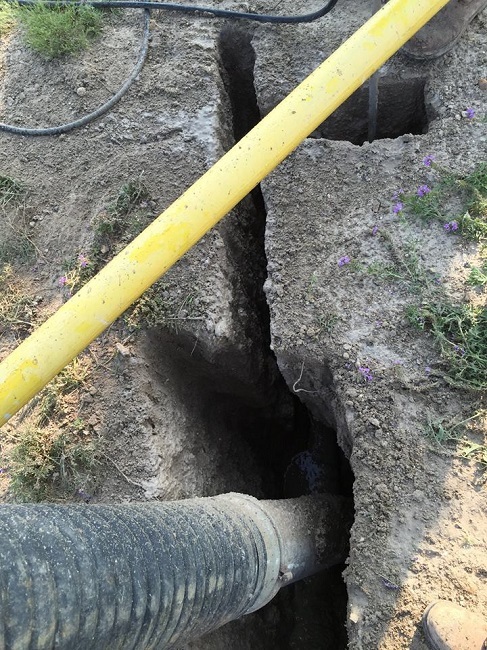 When it comes to excavation services, hydro excavation is perhaps the most misunderstood. However, the advantages of hydro excavation benefit all businesses. Here are a few of the top advantages. 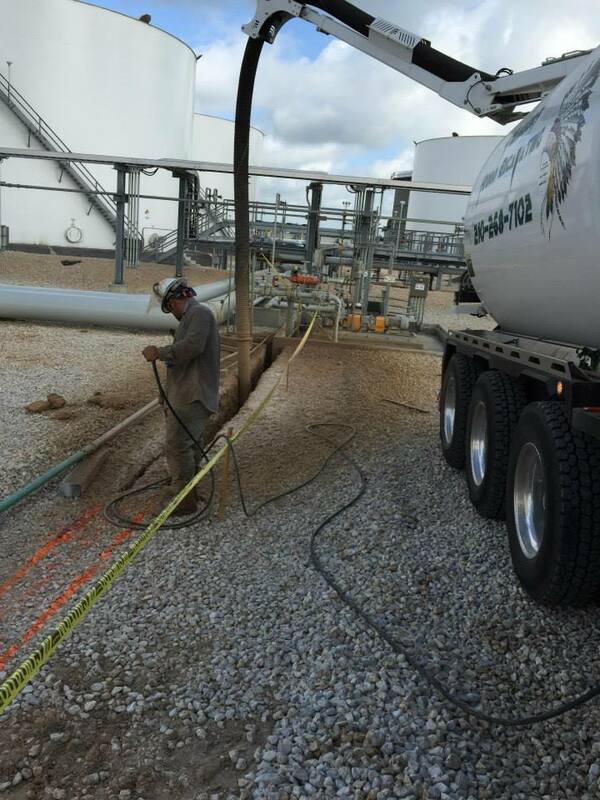 Moving large amounts of soil through traditional force methods causes undue strain on the piping and the infrastructure of surrounding buildings. There are also many mechanical concerns with traditional excavation techniques. 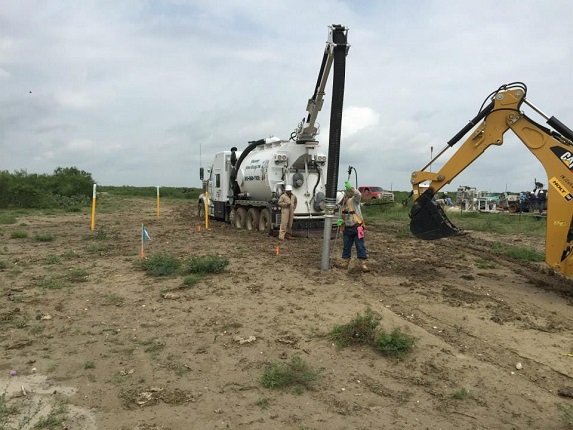 Hydro excavation lowers the risk for the surrounding community as well as the risk for the construction workers who are actually performing the excavation. Hydro excavation is a low-cost method when compared to traditional excavation methods. Because the process only water and an air vacuum, the effects to the surrounding environment are virtually nonexistent. 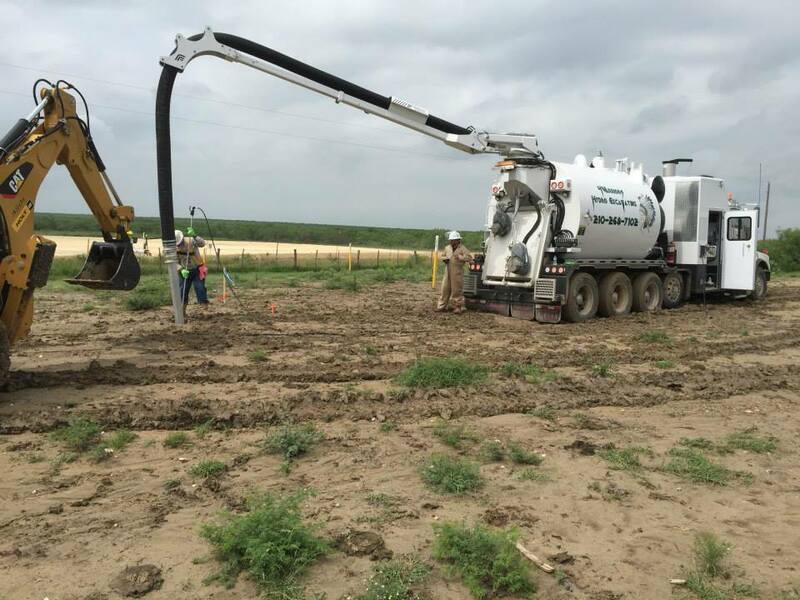 Because the risk of damage to the surrounding environment goes down, insurance companies offer better rates to excavation companies that are using hydro excavation. Savings from the reduced insurance rates are usually passed along to the customer. There are actually situations in which additional excavation techniques cannot be used. Very precise construction projects require precision excavation technique. 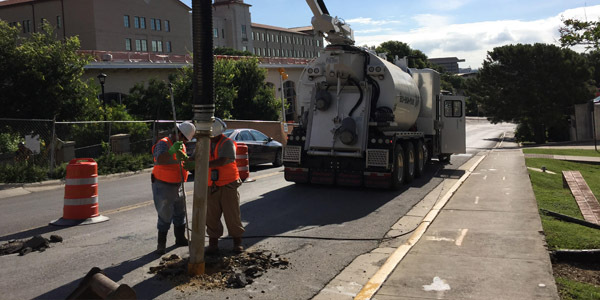 The much cleaner and more precise direction of Hydro excavation ensures that even the most delicate operations complete themselves while remaining compliant with federal regulation and municipal law. Hydro excavation also requires less backfilling and additional repair after the excavation completes itself. Feel free to contact us concerning safe and cost-effective excavation services. As a Christian, family owned company, we pride ourselves on bringing a positive experience to your business and to your life.